The latest sock from the ‘Ulimate Thermal Sock’ makers, Heat Holders’ Ski Socks are endorsed by no less an expert than BBC TV's Ski Sunday pundit and champion skier Graham Bell. 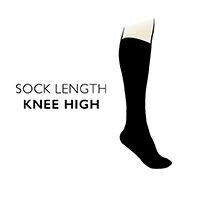 The extra long, thickly padded sock is ideal for skiers and all winter activities, cushioning the lower leg and foot while keeping them blissfully warm. Heat Holders are officially 2.34 tog rated for thermal performance, with a specially blended bulk yarn, extra long cushion loops and intensive brushing process, helping them hold more warm air close to the skin than other socks. Heat Holders Ski Socks have a distinctive contrast cuff, toe and heel – make sure you buy the real thing!